As part of national Jazz Appreciation Month, the Jazz Arts Group of Columbus (JAG) will host its Inside Track season finale on Saturday, April 6 at both a familiar and not-so-familiar venue, the historic Garden Theatre (now managed by Short North Stage). First opened in 1920 as a vaudeville and silent movie theatre, the Garden Theatre’s Green Room will be transformed into an intimate jazz cabaret for virtuoso bassist and composer Kyle Eastwood. 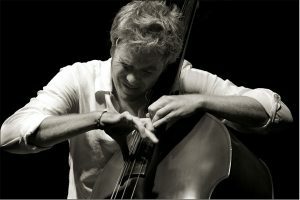 Today, Kyle Eastwood is less and less known as the son of Clint Eastwood and more of a universally respected musician and leader in his own right. A virtuoso bassist on electric and upright, as well as a talented composer with a keen ear for great tunes as well as the subtleties of modern jazz, he is right at the forefront of the contemporary scene. In addition to his six solo albums, Eastwood has also contributed music to eight of his father’s films: The Rookie (1990), Mystic River (2002), Million Dollar Baby (2004), Flags of Our Fathers (2006), Letters from Iwo Jima (2006), Changeling (2008), Gran Torino (2008) and Invictus (2009). And while he takes pride in those credits, his most personal, fully realized and rewarding project to date is his current quintet offering, The View from Here. Advance tickets are on sale now for $20 (general admission) and available online at www.jazzartsgroup.org and www.shortnorthstage.org. Due to limited seating, two separate performances are scheduled to begin at 7:00 PM and 10:00 PM.